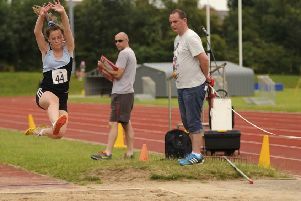 Williams, who runs for Kettering Town Harriers, secured her second European qualification mark in the space of eight days with a time of 2.06.22 in the 800m – a new personal best by half a second. Competing in the women’s match race as a guest, the 16-year-old Northampton School for Gils pupil was the youngest in a field packed with senior women and U20 Great Britain athletes who have competed and won medals on the world and European stage. But Williams wasn’t fazed by that, and her superb performance saw her take fifth place in the nine-runner field. Sharing a lane with U20 Isabelle Boffey, a European youth gold medallist, Williams got off to a great start and quickly established herself in the mid-pack, sitting a little off the pacemaker who split in 59 seconds. Williams looked comfortable as she split in 62 seconds and she continued to work hard on the back straight and positioned herself for her finish, surging past European U20 gold medallist Kha Mhlanga in the final 150m to set a superb new PB in her opening 800m race of the season. On this evidence, Williams will have a lot more to offer when she hits peak form in five to six weeks’ time. The time ranks her second in the UK over the distance for U17s and third in Europe. And that complements her UK number one ranking for 1500m (second in Europe) and Williams now boasts both European U18 qualification marks. She will now be looking to put in another strong performance over 800m when she competes in the second BMC GP meeting at Watford this weekend.